When it comes to blogging, sometimes I get so excited about the post that I've created that I can't help but press the publish button straight away. However, obviousily that's not always a great idea. Therefore, I've created this post as a kind of checklist, to ensure I ticked everything off before I publish. 1. Have I included all necessary keywords? SEO can be confusing when it comes to blogging, especially as the world of SEO is always changing. What was once considered 'good SEO' has now changed as the interest has developed. I know myself that it can be hard to keep up with the latest SEO trends, however, the one thing that I do without fail is include all necessarily keywords. SEO keywords are the keywords and phrases in blog posts that make it possible for your site to be found via search engines. Therefore, to make your articles as google-friendly as possible, it would be a good idea to add a few keywords that people might type into google. For example, if you are writing an article about the Spring lipsticks, you can use a keyword finder to see what people are searching and what phrases would be best to include in your article. Using the keyword finder for 'Spring lipsticks' it's suggested to add keywords such as 'best coral lipstick', 'best lipstick shade' and 'Spring lip colours'. Adding keywords and phrases makes your article more likely to be found through google searches. It's good for hit rates and getting your blog out there. You probably naturally already add keywords and phrases without even realising it, but it's great to just check so that your blog post is fully optimised. 2. Have I linked back to previous articles? Adding a link back to previous articles is great for numerous of reasons. For one, it can decrease your bounce rate, so that people are staying on your blog for longer, reading different articles you've written and in turn, increasing your blog views. In addition, it can increase your DA and it's just better for SEO. 3. Have I named my images? Another SEO little tip that I've talked about a few times. Think about when you're googling information, say you're looking for 'Urban Decay Naked Palette's Swatches' or 'How to Wear Embroidery This Spring' you're more likely to click on the image section of google to see for yourself. This is where you want your images to be for your blog posts. If your image is named 'DC692889457298' it probably will never be found on the internet. However, if you call it 'Urban Decay Naked Swatches' then your image is more likely be found and may click through to your website, increasing the hits. 4. Have I checked grammar and spelling with Grammarly? The Grammarly app is an absolute life saver. It's a little add-on you can download and add to your browser and it flags up all the grammar and spelling mistakes you've made in your writing. I personally find it better than Words spelling checker and the one in blogger. It's a complete game changer and picks up the smallest grammar mistakes that you might not have picked up without it. I make sure I check everything with it and I would really recommend it for anyone. 5. Have I added all necessary links/affiliate links? For some, making a little bit of money by blogging is a dream. Personally, I see my blog as a business, therefore why wouldn't I want to make a little bit of money from something I love? One of the simpliest way to do this is through affliate links. If you recommend a gorgeous little black dress, adding an affliate link to the said item does no harm whatsoever. So before you hit publish make sure you're linked to everything you've mentioned and add in a few affliate links if you like. Here are some more little SEO tips to check before you publish your post. Again, it's all about making sure your article can be found on google. For blogger, in your post settings when writing a blog post, ensure that you've written a search description. The search description should include your main keyword you've used in your post (see point 1) and a little bit of what you're post is about. Wordpress can be a little more than that. I used blogger for personal use, but wordpress for work. Wordpress has a handy SEO keyword feature that makes things simplier, however it took my ages to clock on and understand the right way to do it. For Wordpress, I always want to ensure I've got a H1 (heading 1) and H2 (you guessed it, heading 2), H1 would be your title with your main keyword in it and H2 is just a sub heading with a second keyword it. Complete the SEO section ensuring you've added your focus keyword, meta tags and descriptions to fully optimsise SEO. 7. Does my title relate to what my article is about? Back in the day, my title for blog posts had nothing to do with the actual content. They were mostly song titles and they gave no indication about what the post was actually going to be about. If you're using your blog for you and aren't interested in making your blog searchable, then you do you! Who cares really. But, if you want your blog posts to be found through google, then I'd recommend a title with keywords that people might search for. 8. Is there a question at the end of the article? We all know that comments are in the decline. Interaction happens more on twitter or other social media platfroms, one simple way to encourage comments is to add a question at the end of your posts. It's not super effective, but I always enjoy answering a questions when I'm leaving blog post comments and it might encourage people to leave ones on yours. 9. Have I added a label? Adding a label is a job that takes less than 10 seconds, however it's something that I don't always remember to do! 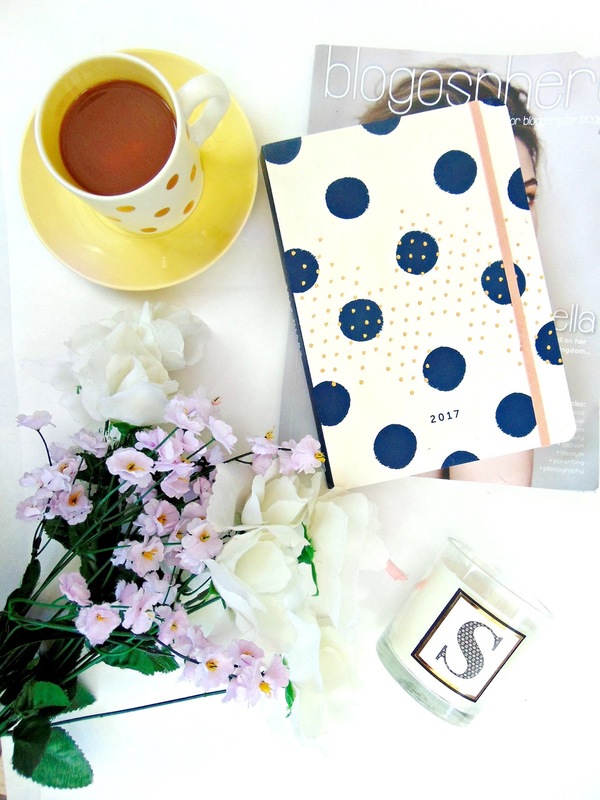 Bloglovin has started picking up labels and putting your blog posts into categories. You can now search blog posts through tags, so I definately think it's worth doing. It's also handy if you have a label category on your blog. If someone's on your blog, they may be purely interested in the beauty posts. I have a drop down on my blog that allows you to go straight to all the posts that are labelled as 'beauty'. It can decrease bounce rate and it just makes your blog easier to navigate. 10. Is it scheduled for a popular time? I'm not sure if there is a 'popular' time for blog posts to be published. However, I think that the best time to publish posts are in the morning, normally around 7am. It might catch people on their morning commute. I don't like scheduling the posts in the evening simply, because I think they're more likely to be missed. I don't read blogs in the evening as I much rather watch a film with my boyfriend or jump on a twitter chat, so I find the mornings the perfect time for me. Obviousily, this one is just an opinion. Everyone has different times they would recommend for posts, this one just works okay for me! 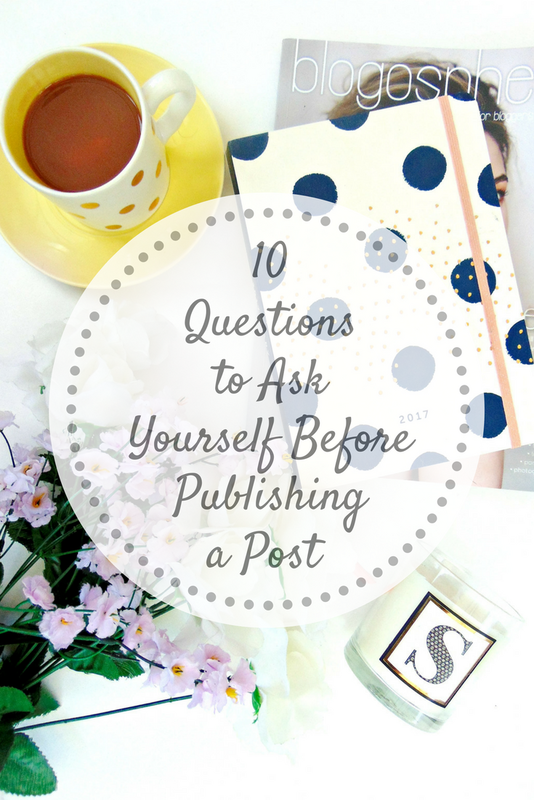 What do you ask yourself before publishing a post?